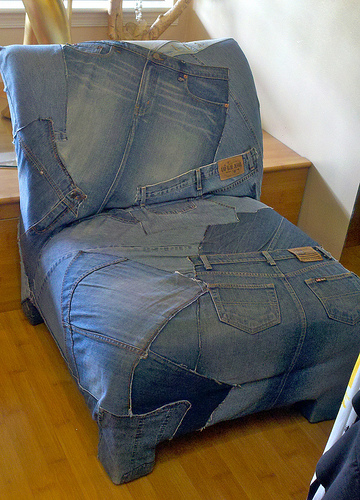 The next category to cover in my exploration of denim is uses in furniture. I am including this category just to be as complete as possible with the theme. Most of this stuff isn't to my liking - although it might have been when I was 16. It is amazing what people will do with and old pair of jeans. 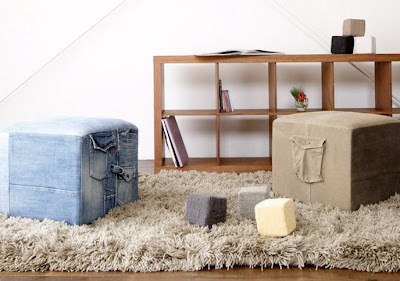 This first ottoman is kind of cool if you have separation problems with your old jeans. You can send three pair to this Japanese company and they will cover an ottoman with them. I'd like it better if it were a lidded ottoman. I think spaces this size are valuable storage space that shouldn't be overlooked. 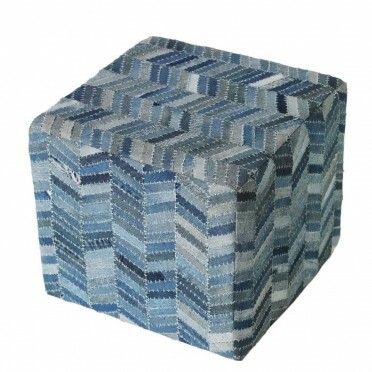 Here is another ottoman available from Via Terra. It again has the storage problem but I do like the mixed denim in the chevron pattern. Outrageous decorating isn't my style but here is a sofa certainly worthy of note in the world of denim. What an interesting combination of causal with elegant. But there is no doubt that one can do some things that are a little over the top with any fabric. Here is an example of a chair reupholstered in recycled jeans. They refer to it as a scrappy slipcover. You can also purchase denim that is over done. It isn't only available in the DIY market. Just check out this sofa. Barn decor for sure! If this is the first of my posts you've stumbled upon you should know it is part of a series on denim. Below are links to six previous posts that also are part of this series and have many more ideas. I have been enjoying your series on denim. 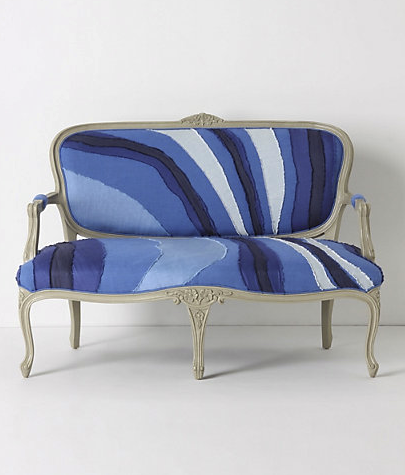 The Anthropologie settee is worth noting, though I'd rather see it in a house I visit than in my own home. The Martha Stewart rug from yesterday is more my style and I've added it to my to do someday list. Judy, Send hotos if you make something. I still haven't done my denim projects after all that posting. Need to get focused here! I really am getting the feeling that denim is getting on a new train of fad during these times because more and more manufacturers and brand names are trying to get denim mixed in with any types of clothing or furniture at that. Denim seems to never go out of style. It gets pair with whatever the current fad is. Denim with neon, denim with chevron, etc. I was only surprising to see these and saying what are these? Some designer make totally different or new design with unlike utensils which I never expect. 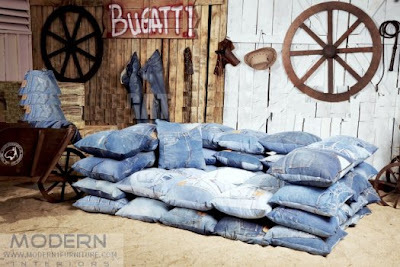 But looking modern and not so bad this denim jeans sofas.